Dr Xanne Janse de Jonge is placing the little-explored field of female hormones in sport performance in the research spotlight. The gender divide in science has oft-seen research focusing on humans in general, rather than differentiating men and women. The fundamental biological differences between men and women are under-explored, with women under-represented in a range of medical studies. It’s an area that Xanne is examining in her work on women and exercise performance. An ongoing curiosity about how the body worked had people suggesting Xanne pursue a career in medicine – but she sought a more sporting-bent. “What got me into studying Sport Science was mainly my own competitive sport background,” Xanne explains. UON Central Coast is a hub for exercise and sport science, with many researchers working with local sporting groups. Upon arriving at UON Xanne approached the Central Coast Mariners Football team and has been working with them for over 10 years now. “We’re monitoring whether players are ready to compete or train again after matches. We’re working with the players after matches and do some wellness and physical fitness tests to provide feedback to their coaches on whether they’re ready to train – or if they might need some rest or rehab first”. Xanne feels that she’s barely scratched the surface in terms of research into women, hormones and performance, “I’d love to gather a few more HDR students to really explore this topic,” she says. One of the problems Xanne faces in pursuing her research is in recruiting enough women participants to study. “You need to find enough females that have regular cycles to commit to three months of training,” Xanne explains. In order to understand the women’s cycle, Xanne and her team take blood samples at three different times of the month to assess hormone levels and have the women do a urine test at ovulation time. “We then ask the women to advise the team when they get their period.” All this information is needed to make sure the women are tested at the right time in their cycle. Xanne completed her "doctorandus" studies (Bachelor's & Master's) in Human Movement Sciences at the Vrije Universiteit Amsterdam in 1995. Her major was Exercise Physiology and as part of her studies she conducted a research project at the University of Sydney. Xanne spent the next few years travelling back and forth between Sydney and Amsterdam on research awards and fellowships. She settled permanently in Australia in 1998 and completed her PhD on the menstrual cycle and exercise performance at the University of Sydney in 2002. She then worked as an Exercise Physiologist in musculo-skeletal rehabilitation, as a sports facility coordinator and as a lecturer at the University of Western Sydney. Since 2006 Xanne has been a lecturer in Exercise & Sport Science at the University of Newcastle. 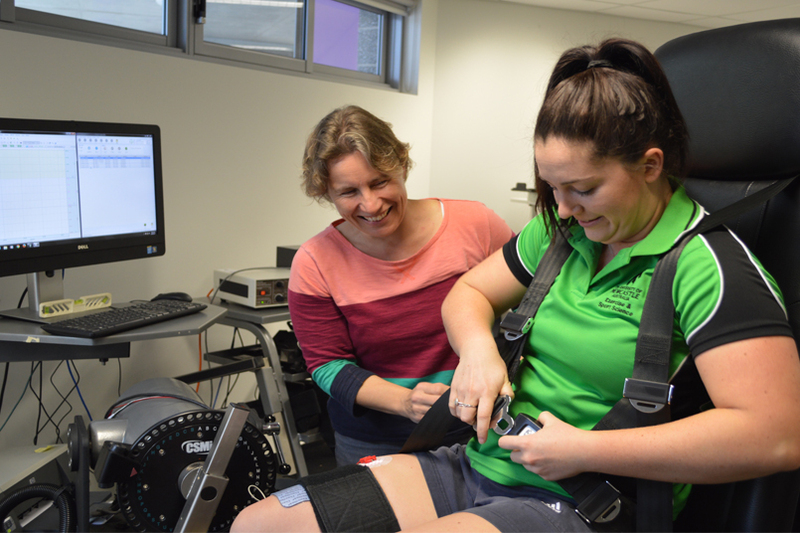 Besides her research interest in exercise performance and trainability in females, Xanne has also been collaborating on applied sport science research with the Central Coast Mariners FC and the Judo Federation of Australia. One of the main areas of my research so far has been the effects of female hormones on exercise performance. Throughout ovulatory menstrual cycles women are exposed to continuously changing female steroid hormone profiles, while the use of oral contraceptives suppresses these fluct. The physiological changes accompanying these hormone fluctuations may affect exercise performance. As an acknowledgement of my expertise in this area I was invited to write a review on this topic for Sports Medicine. Research into the effect of the menstrual cycle on exercise has grown significantly since publication of my review. It signifies an important step in the catch up in the area of female exercise physiology. Areas of focus in my menstrual cycle research are temperature regulation, endurance performance, aerobic performance and muscle function. I am also interested in assessing if the "trainability" of females is affected by the fluctuations in female steroid hormones. My research on the influence of the menstrual cycle phase on skeletal muscle characteristics was published in the Journal of Physiology. This research addressed methodological problems identified in earlier work and provided clarification on an ambiguous topic. The research investigated muscle function during three phases of the menstrual cycle (early follicular, late follicular and mid luteal) as identified by significantly different concentrations of oestrogen and progesterone. Muscle function was measured both through voluntary muscle contractions and through the use of electrical stimulation. The results of this study suggest that the fluctuations in female reproductive hormones throughout the menstrual cycle do not affect muscle strength, fatiguability and contractile properties. My other areas of research are described below in the section "Collaboration". A strong research focus is the time-motion analysis of soccer through our link with the Central Coast Mariners Football Club. GPS technology is used to record position, velocity and acceleration during matches and training. The advantage of GPS technology is that it is more accurate than previous techniques and is able to record position and velocity for every second of a match and/or training session. The Exercise & Sport Science staff and research students are tackling the challenge of processing and analysing the enormous amount of data and generating a useful summary of the player's performance. This information is useful because it allows the estimation of the physiological demands of playing soccer. It also provides useful information to coaches that can be used to design optimal training regimes. In 2010 Xanne spend 5 months at the VU University Amsterdam collaborating on research on methods of training monitoring during team sports, in particular soccer. Xanne has also established links with psychology to focus on wellness of professional soccer players. As part of the Sport Science Advisory Committee of the Judo Federation of Australia, Xanne is involved in applied sport science research in judo focusing on the national team. In 2017 Xanne was invited to present at the International Congress on Soldiers' Physical performance on the biological aspects of gender integration on military performance. Organisation: Sports Medicine published by Adis International Description: I was invited by the journal Sports Medicine to write a review on "the effects of the menstrual cycle on exercise performance: an update for Sports Medicine". Sports Medicine is an international journal that focuses on definitive and comprehensive commissioned review articles that interpret and evaluate the current literature. All manuscripts are subject to peer review by international experts. Background Poor core stability is linked to a range of musculoskeletal pathologies and core-strengthening programmes are widely used as treatment. Treatment outcomes, however, are highly variable, which may be related to the method of delivery of core strengthening programmes. We investigated the effect of identical 8 week core strengthening programmes delivered as either supervised or home-based on measures of core stability. Methods Participants with poor core stability were randomised into three groups: supervised (n=26), home-based (n=26) or control (n=26). Primary outcomes were the Sahrmann test and the Star Excursion Balance Test (SEBT) for dynamic core stability and three endurance tests (side-bridge, flexor and Sorensen) for static core stability. The exercise programme was devised and supervised by an exercise physiologist. Results Analysis of covariance on the change from baseline over the 8 weeks showed that the supervised group performed significantly better on all core stability measures than both the home-based and control group. The home-based group produced significant improvements compared to the control group in all static core stability tests, but not in most of the dynamic core stability tests (Sahrmann test and two out of three directions of the SEBT). Conclusions Our results support the use of a supervised core-strengthening programme over a home-based programme to maximise improvements in core stability, especially in its dynamic aspects. Based on our findings in healthy individuals with low core stability, further research is recommended on potential therapeutic benefits of supervised core-strengthening programmes for pathologies associated with low core stability.